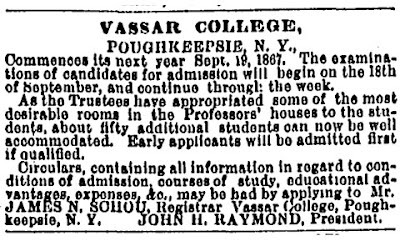 Can you believe that there was a time when Vassar and other top colleges actually had to put out advertisements in order to attract students? That was the case almost 150 years ago, when President Raymond put the above ad in The New York Times. From NYT: "Vassar dangled posh room assignments. Ads it ran in September 1867 recounted how its trustees had appropriated 'some of the most desirable rooms in the Professors’ houses,' for student use. As a result, 50 additional collegians could be “well accommodated” on its Poughkeepsie, N.Y., campus. 'Early applicants will be admitted first, if qualified,’' the college noted in a coy attempt to get prospective students to take the bait, er, hint."